A cautiously bold move. Or, perhaps, a boldly cautious move. In choosing the Argentine Cardinal Jorge Mario Bergoglio, the cardinals of the Catholic Church are trying to indicate that they are open and listening to calls for change, while hewing carefully to their traditions and the conservative doctrine of the past two Popes. We will see in the coming months whether to put the accent on caution or boldness. The choice of Cardinal Bergoglio does mark a series of firsts: the first non-European Pope in modern times (there were Middle Eastern and North African Popes in the first several hundred years of the Church); the first Latin-American Pope; the first Jesuit Pope—interesting, since the Jesuit order has been viewed with some suspicion in Vatican circles as excessively liberal and intellectual; the first Pope to take the name of Francis, in homage to St. Francis of Assisi, whose life of poverty and attention to the poor was a radical challenge to the monarchic papacy of his time. 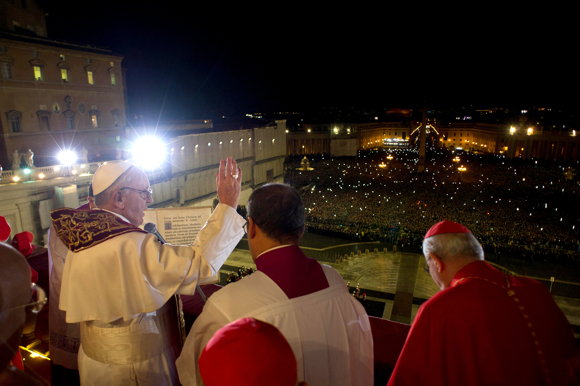 Bergoglio made a point of wearing simple vestments, even as he greeted the crowd in St. Peter’s Square. Rare among modern Popes, he has not served any time in one of the offices of the Vatican bureaucracy in Rome; indeed, he has made some sharp remarks about the vanity, self-infatuation, careerism, and pursuit of promotions in the Roman Curia. As Archbishop of Buenos Aires, he apparently preferred to be called Father Jorge, and was known for his preoccupation with the city’s poorest, reportedly washing and kissing the feet of patients suffering from AIDS. These elements of novelty made Bergoglio attractive as someone who might counteract the growing perception that the leadership of the Catholic Church is a closed Roman fortress, hopelessly out of touch with the concerns of the 1.2 billion ordinary believers outside. “It seems the cardinals have gone to the end of the earth to pick me,” Pope Francis said yesterday. The majority of cardinals are still from Europe and the United States, while roughly three-quarters of the world’s Catholics are located in Latin America, Africa, and Asia. There is a tension between the center and the periphery…. We must get out of ourselves and go toward the periphery. We must avoid the spiritual disease of the Church that can become self-referential: when this happens, the Church itself becomes sick. It’s true that accidents can happen when you go out into the street, as can happen to any man or woman. But if the Church remains closed onto itself, self-referential, it grows old. Between a Church that goes into the street and gets into an accident and a Church that is sick with self-referentiality, I have no doubts in preferring the first. And, in many ways, Bergoglio is not such a radically innovative choice. He is the son of immigrants from northern Italy who settled in Argentina, which prides itself on being the most European (and Italian) country in South America. Bergoglio is a white male of seventy-six, only a year younger than his predecessor, Joseph Ratzinger, was when he became Pope Benedict XVI. Benedict’s advanced age and deteriorating health—the stated reasons for his surprising resignation last month—was seen as contributing to what is widely perceived as a fairly ineffective papacy that left the Church dangerously adrift. Bergoglio’s frail but kindly looking figure standing at the window of Saint Peter’s Basilica, asking the world to pray for him, as well as for Benedict, seemed eerily familiar: another fragile, elderly white man trying to uphold the tradition. (In the twenty years since Pope John Paul II developed Parkinson’s disease and began to show his age, this is all we have seen.) While Bergoglio is known for his belief in working with the poor, he is doctrinally a conservative very much in the mold of his predecessors. Indeed, all of the hundred and fifteen cardinals voting were appointed by Benedict and Pope John Paul II. Bergoglio was a staunch opponent of liberation theology (an attempt to mesh the Christian Gospel with left-wing politics). In Argentina, where traditional attitudes are changing much as in Europe, he clashed with the Argentine government on the issue of adoption by gay couples, a practice that he denounced as evil. As much as many American Catholics hope that a new papacy will reopen taboo subjects—such as the ordainment of women, married priests, divorce, contraception, and homosexuality—this is highly unrealistic. In truth, there was never going to be a battle between traditionalists and liberals in the Church. That doesn’t mean, however, that Francis isn’t stepping into the middle of a fight. The story line of leading Vaticanisti was that the main cleavage among the cardinals was not between liberals and conservatives but between reformers and defenders of the power of the Roman Curia. Pope Francis clearly belongs to the first category. Before locking themselves in the Sistine Chapel for the conclave, the cardinals were apparently briefed on the contents of a secret investigation into the scandal known as Vatileaks, the systematic leaking of papal documents last year. The report apparently contains an account of bureaucratic intrigue, financial corruption, and mismanagement, as well as sexual misconduct. One can expect a Pope who, assuming his health permits, will try to reach out to the periphery, as he puts it. Within the Vatican, there is a widespread view that one of the Church’s largest problems is communication and public relations. The Church’s message, the thinking goes, is deeply sound but needs to be delivered in a more effective way. And Bergoglio has a reputation as a communicator with an appealing down-to-earth touch. He understands the issues of the Latin-American Church, which has been losing ground to a variety of evangelical Protestant denominations. Interestingly, one of Francis’s first public acts will be a meeting with the world press corps—six thousand of whom have thronged to Rome—a highly unusual move, recognizing the need to court public opinion. But better communication may not be enough to reverse a series of negative trends within the Church: fewer people ready to become priests and nuns in many countries, declining church attendance in Europe and the United States, and a solid majority in those countries of Catholics who openly disagree with the Church on most issues of personal and sexual morality, from contraception and divorce to the ordination of women and homosexuality. The Church is tired in Europe and America. Our culture has gotten old: our churches are large but our religious homes are empty, the bureaucratic apparatus of the Church grows while our rites and our vestments are pompous… The scandals of pedophilia should push us toward the road to conversion…. We need to ask ourselves whether people are still listening to the Church on these issues of sexuality? I think about divorced couples who have remarried, with expanded families.… Let’s say a woman is left by her husband with three children. Her second marriage works. If this family is discriminated against not only she but also her children will end up outside the Church… and the Church will lose the future generation…. The Church has remained two hundred years behind: Why doesn’t it move? Are we afraid? Given Bergoglio’s age and doctrinal orthodoxy, his choice suggests that the Church does want to move—but not much, or too fast.